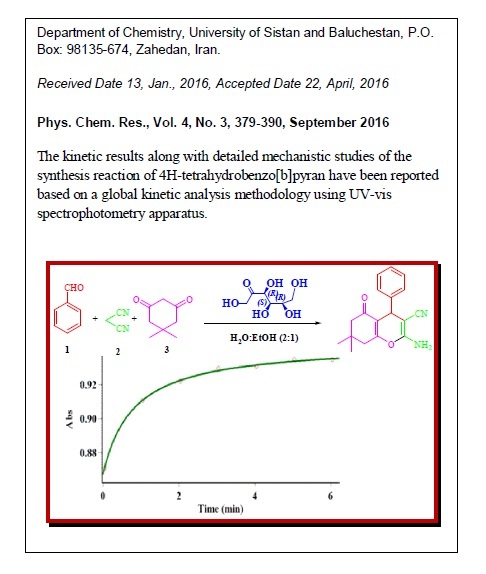 The kinetics and mechanism of the reaction between benzaldehyde 1, malononitrile 2 and dimedone 3 in a mixture of ethanol and water as solvents in the presence of fructose as a biodegradable catalyst has been studied by the spectroscopic method (UV-Vis spectrophotometry method). The influence of various parameters (temperature, solvent and concentration) was studied on the reaction by means of the pseudo-first order kinetic model. 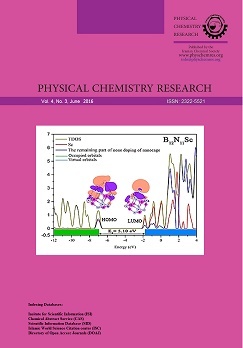 Based on the experimental data, the overall order of the formation reaction of tetrahydrobenzo[b]pyran followed the second-order kinetics and under pseudo-order conditions the partial orders with respect to 1, 2 and 3 were one, one and zero, respectively. Kinetic values (k and Ea), associated with the activation parameters (ΔH‡, ΔS‡ and ΔG‡) of the reaction were calculated using the Eyring equation from variable temperature in kinetic studies. The initial step of the presented mechanism was determined as a rate-determining step (k1) and t was confirmed using the steady state approximation.